The Ranching For Profit School will help you to find the breakthroughs that will improve the health and productivity of your ranch, the profitability of your business and the quality of your life. The RFP was built for people who have been there, done that and looking for a simpler, smarter, more profitable way to run their ranches. The value of the school is enhanced when others who are involved in making and implementing big decisions attend together. It is important for the ownership/management team to be on the same page. Decision making employees benefit from the class but can face frustration when they return to the ranch if the ownership team doesn’t understand the RFP insights and tools. When you enroll we send you prework to complete prior to the class. 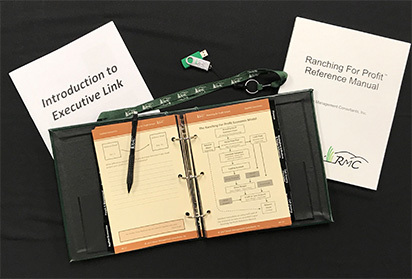 The prework will familiarize you with RFP principles, making it easier to apply RFP concepts to your ranch during the class. At the school you are teamed with participants with different types of ranches from different regions. The class consists of lecture, videos, demonstrations, team and class discussions and individual and group tasks. Individual coaching is available after hours. The course fee for one person attending is $2,750. The fee for each additional person is $2,000. A payment plan is available. Graduates are welcome to repeat the class for only $500. The course fee includes tuition, course materials, refreshments, lunches and a life-changing experience. In addition to the outstanding instruction during the course, RFP teachers offer one-on-one coaching after-hours in the classroom. Participants leave with a prioritized action plan for their ranch. When and where are the schools held? For a current schedule of Ranching For Profit Schools see the Schedule. Do I need to stay at the hotel where the school is held? No, but we recommend that, even if participants live nearby, they stay at the venue so that they can participate in the informal after-hours discussions. Some people commuting to the school have a harder time focusing on $100,000 issues facing their business because they are distracted doing the $10/hour chores at home before coming to class. Is there anything I should do to prepare for or bring to the class? Yes. When you enroll you will be sent prework. This prework will help you apply the business principles you will learn at the school to your own business. Some prework asks you to bring selected financial information to the class. All information is treated with strict confidence, and you don’t have to reveal any more to anyone than you want to. We recommend against bringing reams of financial statements and other records. When people bring raw data to the class they tend to spend all their time looking things up rather than thinking things through. In addition to your completed prework please wear comfortable clothes including a light jacket. (We like keep the classroom cool.) We provide each student with a workbook, scratch paper, pencils, erasers, calculators and everything else you need to learn how to get in control of your business. You’ll work on the assignments in small teams of 4 or 5 other participants and forge friendships that will last long after the school is over. Instruction consists of short dynamic lectures, fun demonstrations and video presentations interspersed with individual and team tasks. Team tasks generally focus on applying course principles and tools to a real case study. Individual tasks generally involve the application of concepts and methods to your farm or ranch. Class Size: Class size varies. Class size has ranges from 20 to 48 students. Regardless of class size, you’ll be working in a team with 4 to 5 other participants. Class Hours: The RFP school begins at 3 pm sharp on a Sunday. We offer a get-acquainted reception ½ hour before the class starts. The day ends at 7:30 with a dinner RMC hosts for class participants. Monday through Friday class begins at 8:00 a.m. and ends at about 5:00 p.m. On Saturday class begins at 8:00 a.m. and ends at noon. Each night there will be homework to complete in which you’ll apply the principles of Ranching for Profit to your own business. How much does the school cost and what does the fee cover? The fee for the school is $2,750 (U.S.) for the first person from your business. Additional people attending the school from the same business pay the discounted fee of $2,000 (U.S.) per person. The second person rate applies as long as a person is taking the class within the same school year. Alumni may repeat the school for only $500 (U.S.). The hotel and lodging costs are separate and vary from location to location. The course fee includes tuition, pre-work materials, a workbook with a comprehensive set of school notes, and a reference manual with step-by-step instructions for all of the processes taught at the school. You will also receive a flash drive with all of the economic forms used in the classroom. The fee also includes a meal package which provides daily coffee, pastries, mid-afternoon refreshments, and lunches Monday through Friday. Ranch Management Consultants hosts a dinner the first night of class (Sunday) for all participants. If you complete the Ranching for Profit School and at the end believe you have not received your money’s worth, we will refund the fee. Please read our refund policy. Registration is easy. To register just complete and return the registration form with your deposit of $300 (U.S.), or call us at (707)429-2292 and register with a credit card. Our focus is on people who have been there and done that and are looking for a smarter, simpler, more profitable way to ranch. But whether you are 1st generation or 6th, an absentee owner or a manager, the Ranching For Profit School offers tools and insights to improve your decision making and build a better business. How young is too young and how old is too old? The average age of students varies from 35-45. The youngest students are usually in their late 20’s with older students often in their late 60’s. We strongly advise that young people not attend our program until they have been out of school for a couple of years and have had a couple of lessons in the school of hard knocks. Experienced with numbers? Don’t worry that the school will be too complex or too simple. Whether you have an MBA or didn’t finish high school, the course will meet you where you are. We are known for breaking down complicated concepts into simple principles and step-by-step methods. The course isn’t dumbed-down. MBA’s and accountants attending the school tell us the simple, powerful tools we provide have deepened their understanding and enhanced their ability to serve and advise their clients. Each Ranching For Profit School is taught by one of three highly qualified instructors. For a brief biography of the RFP instructors visit About Us. When the course is over am I on my own to remember and apply these concepts and techniques? No. Our alumni support is unparalleled. RFP Next Steps provides video coaching tutorials and step-by-step assignments to help you apply everything you learned in the class. You will also be eligible to join Executive Link, the most successful alumni network in agriculture. 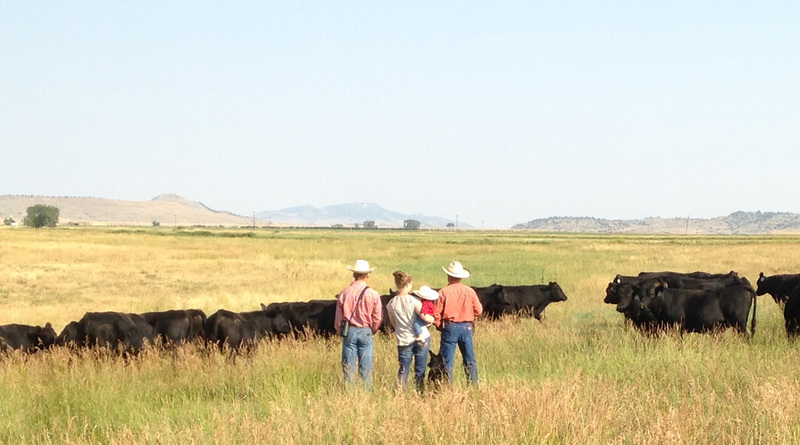 In Executive Link, Ranching for Profit School alumni work together in peer advisory boards. Using a structured review process, they consult with one another about business decisions and hold each other accountable to implement their personal action plans. I am ready to make my ranch more profitable!